Alcott Elementary School students in seven grade levels spent weeks saving their pennies and allowances for a special school fundraiser known as “Penny Wars.” The activity culminated with a presentation of the donations to the charity that was chosen by the students: Wounded Warrior Project® (WWP). The grade that raised the most for WWP won a very special prize: 30 minutes of extra recess time on the playground. Drew Caouette, a 4th-grade student at Alcott who helped organize the fundraiser, was part of the grade that won the prize. He also introduced the special guest speaker from WWP, Cindy Parsons. During the school-wide assembly, Cindy told students about her son Shane, who was seriously wounded in Iraq when a bomb detonated under his Humvee. A challenge coin is a small medallion with an organization's logo that is given out as a symbol of recognition of merit or service. They are popular among military service members. 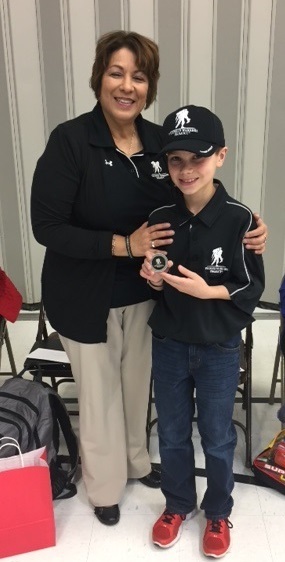 Drew and his mom, Stacey Caouette, who’s a teacher at Alcott Elementary School, also gave out WWP pins, bracelets, and stickers during the assembly. That sense of inspiration continued when Stacey took Drew to the bank to count the money raised by the students at his school. Individual students, classes, clubs, or athletic teams can get involved and support WWP through the Student Ambassadors program. To learn more, visit https://www.woundedwarriorproject.org/give-back/students. And to see more about how WWP’s programs and services connect, serve, and empower wounded warriors, visit http://newsroom.woundedwarriorproject.org/, and click on multimedia.